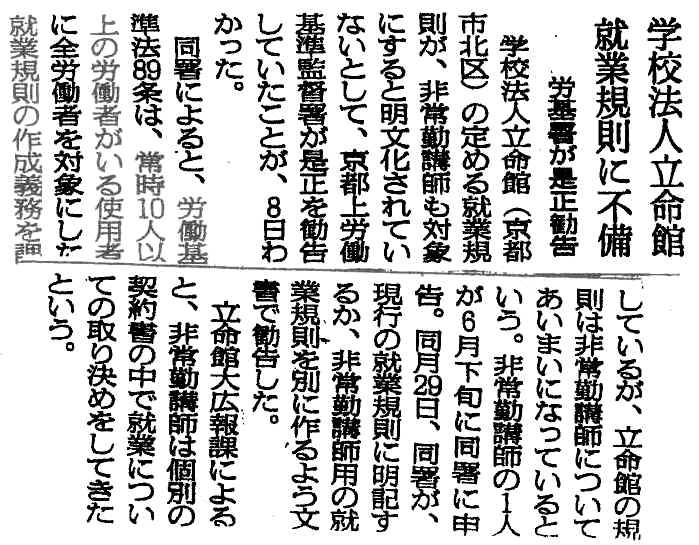 Why is Ritsumeikan getting rid of excellent teachers just when they are reaching their peak performance? After three or four years, teachers are not any good any more? Stop treating contract workers like garbage! Most foreign-language teachers at Ritsumeikan University are hired on a limited-term basis, with annual contract renewals capped at three to five years. Every year, Ritsumeikan engages in the wasteful process of searching for and hiring replace-ments for talented teachers who are willing and able to con-tinue providing an excellent educational experience for their students. This revolving door of teachers damages the quality of education offered to students. With term limits, Ritsumeikan is getting rid of their best teachers just when they are reaching their peak performance at the school. In any new job, a worker needs time to adjust to the environment of the new workplace. After several years in this environment, teachers are able to do their jobs more smoothly and efficiently than when they started. In some cases, teachers have even been asked to create new language programs and teaching materials for the school, which they themselves will not be able to put to use since the university will dispose of them before the new courses are implemented. If Ritsumeikan does a good job of hiring, it is reasonable to as-sume that the teachers they have hired are the best people for the job. After all, the school has taken the trouble to screen re-sumes, interview potential candidates, and select only the best of the bunch before putting teachers in the classroom. The automatic non-renewal of all teachers, regardless of their job performance, contradicts this assumption. 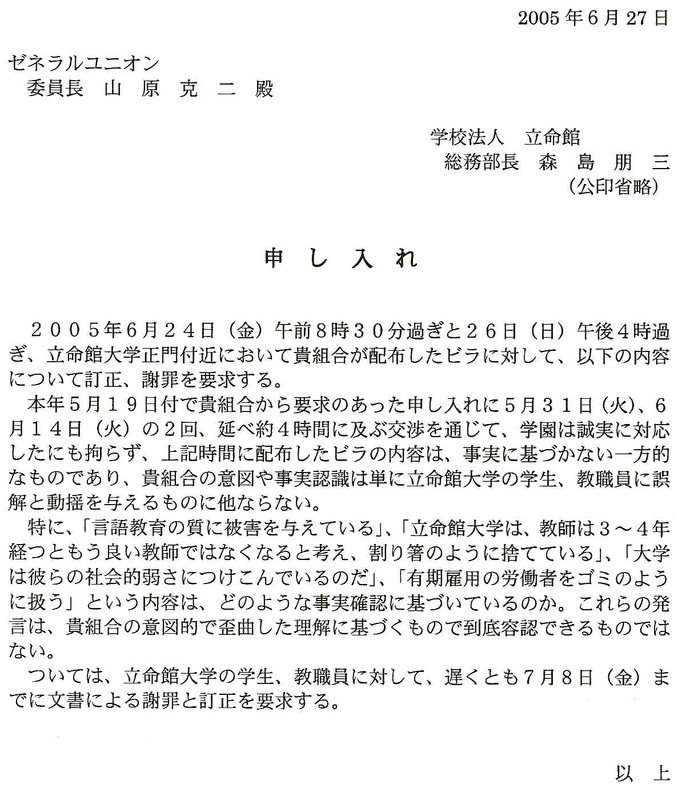 Ritsumeikan as-sumes that after three or four years, teachers must not be any good any more, and casts them aside like disposable chopsticks. If the management really believes this to be a good employ-ment practice, why don't they volunteer to limit themselves to no more than three years as Ritsumeikan employees? Ritsumeikan recruits many students for graduate school pro-grams promising them great future careers, but how does the management treat its own dedicated teachers with M.A.’s and Ph.D.’s? 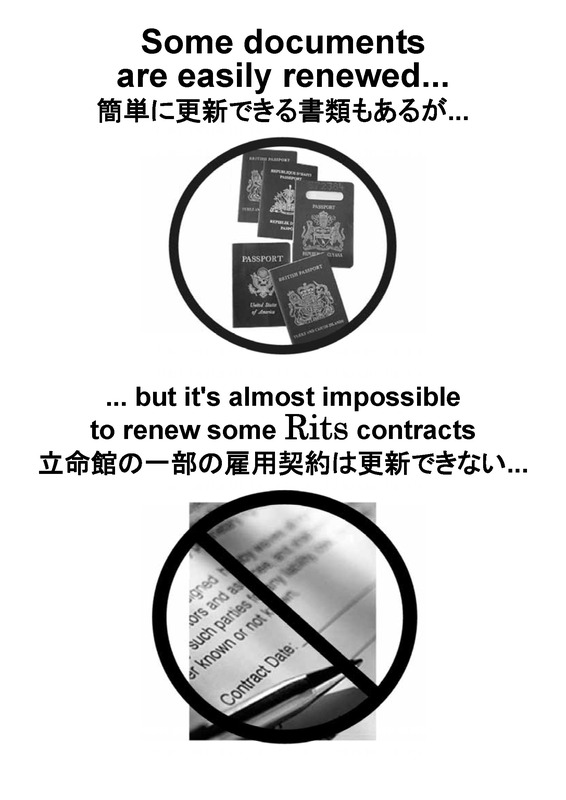 While Ritsumeikan promotes itself as being all about internationalism, peace and democracy, in reality most con-tract workers at Ritsumeikan are women and foreigners, and the management is happy to exploit the weakness of their posi-tion in society. It is in the best interests of the students and the educational program to hire and retain the best possible teach-ers. Stop treating contract workers like garbage. Let them re-new their contracts!